I have been working on Paper Snowflakes this week. I just love this design! I finished up the deer yesterday. Oh this is such a pretty design. I think one that I may need to add to my stash. Great job so far Nicole. With Thy Needle & Thread. I love it too, Nicole! It's looking wonderful! Oh Nicole…this one is too cute. I love the prancing deer !! Good job !! Beautiful! I really love that deer! It is a lovely design. Your stitching is wonderful! Looks fabulous! 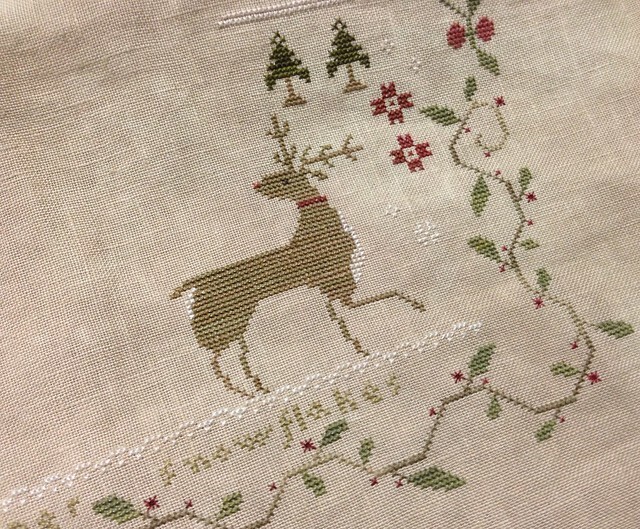 I just started a new stitching blog after a few months hiatus at stitcherista.blogspot.com. I would love for you to visit and become a follower! It is so beautiful! Lovely stitching! Now this would not be my style ... but it is rather lovely. The deer and the colours around the piece are just beautiful. 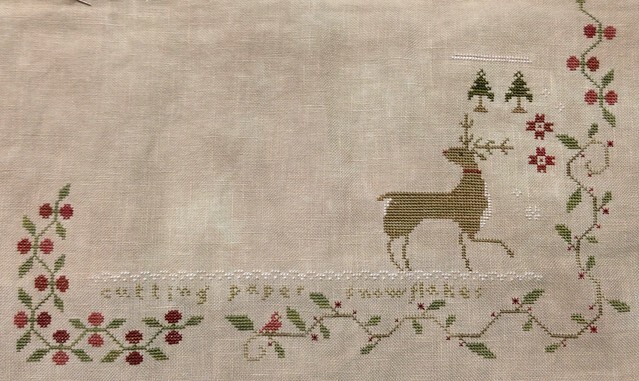 This is a lovely project - great stitching! I just love that little prancing deer! Your stitching is beautiful! So pretty! I especially love the border! Looks beautiful! The color palette on this design is gorgeous! Nicole, I'd almost given up...for a while I'd been trying to visit your blog, but it kept on giving me a message that I needed to be "invited" to see your blog. However, today I checked it out...and I didn't need the invitation. I'm thankful because I LOVE your blog...it's inspiring...and it's always fun to see what other people are working on...helps me to find my mojo on the non-mojo days! Thankful to see your works again! This is so very pretty and inspiring - thanks for sharing your gift! Love this pattern...I just picked it up at our retreat at Cecelia's Samplers last month. Love your fabric choice, it's one of my favorites! I start to stitch it and i just love it! !